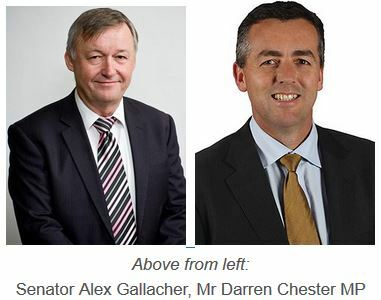 ACRS congratulates Australia’s federal politicians who have launched the Parliamentary Friends of Road Safety Group, ably led by Senator Alex Gallacher and Victorian MP Darren Chester, Parliamentary Secretary for Defence. Representatives from the College recently met with Senator Alex Gallacher, the Labor Senator for South Australia, to discuss implementation of a Parliamentary Friends of Road Safety Group for federal MP’s. Hon Darren Chester MP, our current Parliamentary Secretary to the Minister for Defence, joined Senator Gallacher in initiating this parliamentary friendship group. College members will remember that representatives from the College met with Darren Chester several times during 2013 during the lead up the the federal election. At that time Mr Chester was the Shadow parliamentary secretary for roads and regional transport. I and along with the Member for Gippsland the Hon Darren Chester are extremely pleased that we have been able to form the Parliamentary Friends of Road Safety. Our overall objective is to bring to the fore with all members and senators the importance of road safety and the need to keep road safety a top of mind issue 365 days a year. I look forward to working with the Australasian College of Road Safety along with all groups wanting to make our roads safer. We look forward to supporting the friendship group in meeting their goals, and keeping members updated with latest news from these dedicated politicians. For more information, please visit the Parliament Website and view a recent Blog post by Darren Chester MP entitled Road Safety.